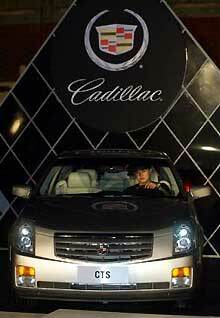 General Motors said Monday it will start making Cadillacs in China this year, joining a race by foreign luxury car brands to sell to the country's newly rich elite. The first Cadillac CTS sedans are to roll into showrooms by spring, GM said Monday. It said Cadillac will sell imported models while it prepares to assemble cars at the company's Shanghai factory using imported components. The announcement is a milestone in China's evolution into a luxury car market. European brands such as BMW and Mercedes-Benz already operate assembly lines in the country, while Ferrari, Bentley and others have set up nationwide sales networks. Both imported and Chinese-made Cadillacs will sell for 518,000 yuan (US$63,170) ― more than double the car's US base price of US$31,345, GM said. The company didn't give a reason for the higher price, but heavier tariffs and material costs in China make most cars far more expensive than they would be elsewhere. Cadillac recently opened its first China showrooms in Beijing, Shanghai and two other cities and says seven additional outlets are due to open by the end of the year. Cadillac's arrival comes amid an aggressive expansion by GM as it challenges Volkswagen for dominance in China, the world's fastest-growing auto market. GM, the world's biggest automaker, announced in June it would invest US$3 billion in China over the next three years in facilities that will more than double its manufacturing capacity. The company is also moving its Asia-Pacific headquarters from Singapore to Shanghai ― a move GM said reflects China's importance to its future growth. GM said it also plans to introduce new vehicles and an auto financing venture with its Chinese partner, Shanghai Automotive Industry Corp.
Shares in GM rose 73 cents to close at US$41.42 Monday on the New York Stock Exchange.